It's probably dangerous to be posting about Christmas gifts, but this one is so simple and quick, I wanted to share it before the holidays. And it is the kind of thing I love to see hanging around my home. Yes, this gift is for Dan, but I think I love it just as much as I hope he will. We're on an extremely small budget for the holidays this year. I've had to be super-organized and super-creative. I've also had to figure out exactly what I want to get each person on my list, versus wandering aimlessly online and in shops, looking for something to catch my eye. Ironically, it has been somewhat liberating to be reigned in so tightly this year. In my mind I came up with a plan–one nice, squeal-worthy gift for each child and a few smaller, inexpensive gifts. But for Dan, I knew I wanted to give him a few things that were either handmade or "created" at home. And this year, I wanted to do something similar–something to mark this year, these ages of our girls. 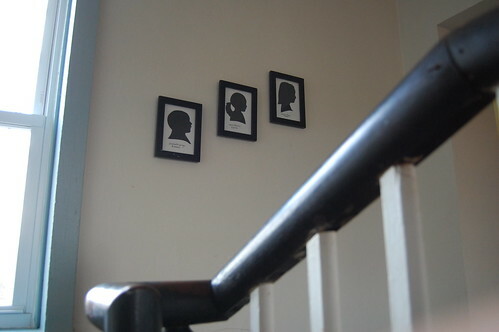 When I was little I remember my handprints, made in paint, hanging on the family wall in our kitchen. And with that idea in mind, I decided to create a fabric version for Dan. 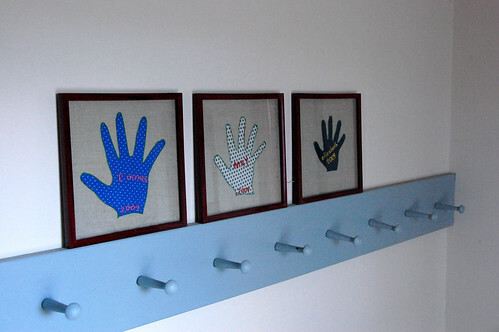 I traced each of the girls hands and then machine-appliqued the handprint onto some linen fabric. With Mary and Emma, I had them write their own names inside of the handprint and I wrote Elizabeth's. 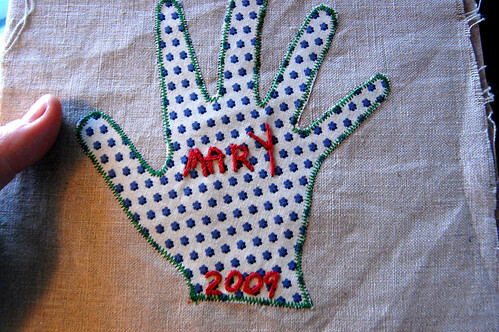 Then I simply embroidered over their names with a split stitch and added the year in which the handprints were created. I was pleasantly surprised to find these frames at the dollar store which fit perfectly. 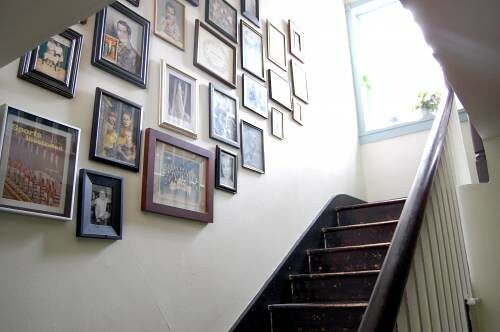 They are not a standard size, but are the type of frame where you'd add multiple photographs of different sizes into a matte board. I removed the matte and slid in the fabric handprints. All in all, the stitching and sewing could easily be completed in a day and the whole project cost me $3, since I only used fabrics and embroidery thread in my stash. And I think they'll be a pretty nice addition to our growing family wall. Stonz booties : Elizabeth received a pair of these last spring. And I can't tell you how wonderful they are. She is still wearing the same pair she received last year–they are warm, (especially with the sherpa liner), durable, easy to wash (even after an episode in the mud), they stay on, and they are so cute. Olive Juice : We've talked on here before about finding (or not finding, actually) classic, age-appropriate clothing for children. And I am completely smitten with this company. Their clothes are classic and well-made and have a touch of vintage charm that I really love. For some of us, the prices may be a little intimidating, but it is well worth your two seconds to sign up for their email list. They have frequent and wonderful sales. I've scored many good deals when they discount all items in their "outlet" to $10. Mary has this shirt. Emma has a dress from them, that I can't find online at the moment. And I absolutely love this, this, and this. Oh! And this, and these! RosieHippo: I'm also excited about this gift that will be making it's way under our tree for Elizabeth. She'll also get a little set of these. A few other handmades catching my eye : with our history, of course I kind of dig these fox pillows–is that strange? I secretly wish I could get one for each of the girls. I love the 2010 Tea Towel Calendar from Cicada Studio. And there is a lot of potential with these blank, unfinished wood cutouts…. Phew! 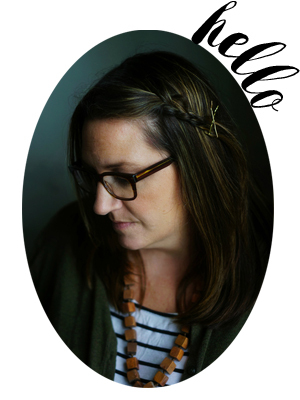 That's enough links for one post….happy handmade, happy crafting, happy shopping. I love your hand print idea! I think I may just have to make some of my own of our two. What a great way to remember how small and tiny they once were. What a wonderful, thoughtful gift! I love it! I love those handprints! If I have time, I may give that a whirl! (Help! I need more time before Christmas! )I, too, have had trouble finding age appropriat clothes. My daughter loves cotton dresses that are hard to find above size 6x. Lands End and LL Bean have great sales at the end of the season. I just got some great deals at both. I did something very similar with hand prints this year, but put them on pillows for the grandparents. It’s such a fun way to mark the time passing. I’m off to look at the clothing links. I have been haunting the Hanna Andersson ebay sales for Annika – they’re her favorite and they wear forever. Thanks! what a gorgous idea…. I love those. We also LOVE Olive Juice at my house. Or rather I love dressing the kids in their clothes. I wish they had adult clothes. Handprints are such a wonderful way to capture childhood. The idea is so simple yet so very sweet – I’m sure that he will appreciate them. I love how you got the frames at the dollar store. Every once in awhile, I too get something unexpectedly good at those types of stores. Thanks too, for the link to Rosie Hippo. They’re stuff looks fun! What a great idea! I love the silhouettes and the hand prints. Just beautiful. Thank you for the link to clothing too! Thanks so much for the handprint idea! I went to Dollar General today and found a frame and just traced my 19th month olds hand while she slept. I am going to use some of her old clothes for the fabric but otherwise I am doing everything you did! Thank you, thank you, thank you! Happy Holidays! Oh I love Olive Juice! I wish I had known about it weeks ago. I have such a hard time finding cute dresses that are not dripping with sparkles!